Known as “Egyptian blue,” the “bright blue crystalline material” first appeared around 2,500 BCE in Egypt and Mesopotamia. The use of the color spread throughout the Mediterranean world and was used extensively until the collapse of the Roman Empire. The color was especially important to the Egyptians because of its symbolism. It was the color of the sky and water, and was representative of the yearly flooding of the Nile. Blue was considered a divine color that symbolized creation and rebirth. Sadly, at around 800 AD Egyptian blue virtually disappeared from art, a casualty of lost science and history. Egyptian blue is actually a synthetic reproduction of a naturally occurring mineral called cuprorivaite. This mineral is so rare that it would have been impossible for the Egyptians to find enough to collect the pigment in nature. What to do? Leave it to Egyptian ingenuity. “Made by mixing sand, lime and copper or copper ore and heating them to around 850-1000°C…it is possibly the earliest artificial pigment ever produced.” It seems clear that the Egyptians saw and appreciated the blue of the cuprorivaite and devised the chemical process by which they could recreate it in large quantities. Marble head from the Temple of Artemis in Ephesus. The Egyptian blue which once colored the eyes is now only visible through infrared imaging. Image courtesy of the British Museum. Obviously, archaeologists and historians want to be able to study and research every piece of art that holds Egyptian blue, but after thousands of years, the paint is often no longer visible to the naked eye. Thankfully, modern technology has allowed us to exploit a unique feature of the blue pigment. Traces of the blue can be identified because they emit infrared light when red light is shone on them. This “luminescence” can be recorded by various devices such as a night vision camera. This technique has allowed for the discovery of Egyptian blue on many ancient artifacts including sculptures from the Parthenon and even artifacts from the Middle East—a broad reach indeed for this stunning pigment. Yet as incredible as Egyptian blue’s past was, its future may be even more impressive. 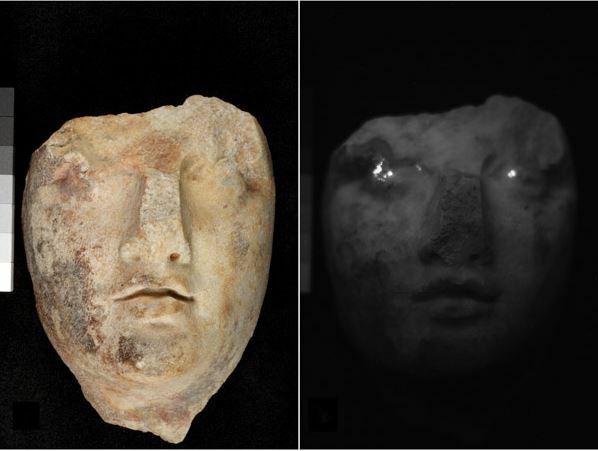 The same unusual luminescent property responsible for its rediscovery on many ancient items could now mean it has a host of “modern high-tech applications.” One use is in biomedical imaging because the near-infrared rays the pigment emits penetrate tissue much more efficiently than other wavelengths. Just think of the enormous benefits of this as a diagnostic tool. Also, the radiation that Egyptian blue produces is “…similar to the beams that communicate between remote controls and TVs, car door locks, and other telecommunications devices,” thus offering numerous possibilities for its use in communications technology. That the splendid blue renderings in ancient art could lead to such life-saving, life-enhancing breakthroughs today is simply astounding. Researcher Tina Salguero, a chemist and materials scientist at the University of Georgia in Athens, Georgia, says that one of the most exciting and unexpected finds about Egyptian blue is its practicality of use. While it does seem extremely durable as a paint, it actually breaks apart into extremely small pieces with surprising ease. This in turn “opens up entirely new ways to incorporate this material into modern applications,” according to Salguero. 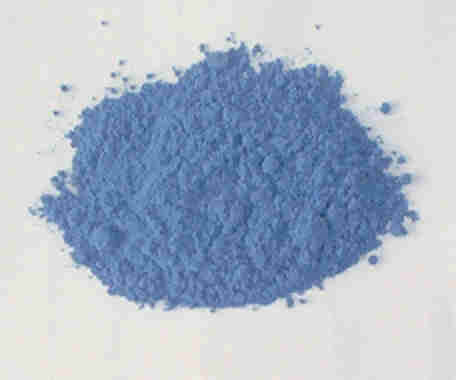 Perhaps the best aspect of Egyptian blue when compared to other materials with similar near-infrared emitting properties is that it is composed of elements that are both inexpensive and abundant. This is so important in an age when many of our natural resources are drying up and rare earth elements are becoming increasingly difficult to find. Especially when considering medical applications, it is necessary to make solutions that are cheap and easily replicated. Egyptian blue certainly has an intriguing past and its future is full of high-tech applications that will likely lead to further scientific discoveries. But don’t forget that beyond its chemical makeup and infrared emissions, it is simply a beautiful color. Just take a minute to look at the slideshow of objects that display this intensely rich pigment, and immerse yourself in the glorious beauty of our ancient past. Discoveries of Egyptian blue pigment at the British Museum. Choi, C. (2013, March 11). Ancient Egyptian Pigment’s Future Now Even Brighter. Retrieved January 8, 2015. This entry was posted in Architecture, Art, Blog, Culture, Science and Technology and tagged ancient art, ancient blue, ancient colors, ancient dyes, ancient history, AntiquityNOW, Egyptian blue, Egyptian dyes, first synthetic pigment. Bookmark the permalink.